Cannot be Special Summoned. 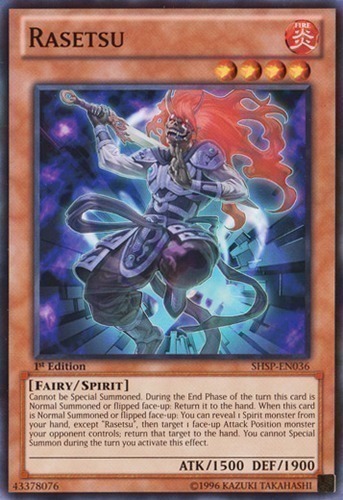 During the End Phase of the turn this card is Normal Summoned or flipped face-up: Return it to the hand. When this card is Normal Summoned or flipped face-up: You can reveal 1 Spirit monster from your hand, except "Rasetsu", then target 1 face-up Attack Position monster your opponent controls; return that target to the hand. You cannot Special Summon during the turn you activate this effect.